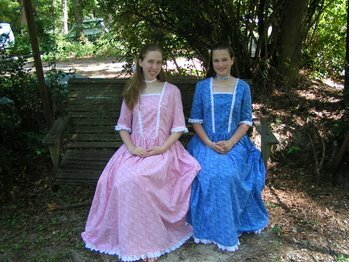 A Graceful Maiden's Memoir: Dresses Completed!! We completed the dresses this afternoon around 3:30 p.m. I was amazed at how quickly we got them done, especially since we didn't even have Friday evening to work on them, as Miriam was accompaning Ben Simon in a recital. But we did, and they're lovely, if I do say so myself! I just had to post a lot of pictures! The full skirt is so pretty and fun! I also really like the fabric we got, little flowers with white and whatever other color we chose. Miriam in her lovely dress. I made chokers from the leftover ribbon, so that we truely looked colonial. Plus, it really finished the look of the dress! 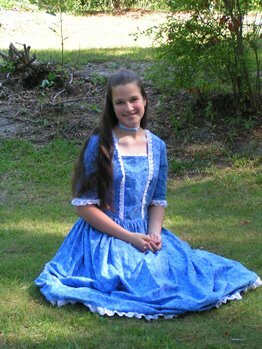 Wonderfully sewn dress of blue, her favorite color! 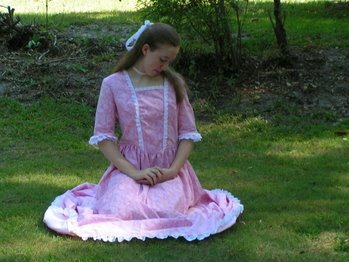 My dress, in my favorite color, light pink! Feeling quite elegant, and wishing we could go to a ball! A view of the back. We used the leftover lace to have hairbows! Beautiful! 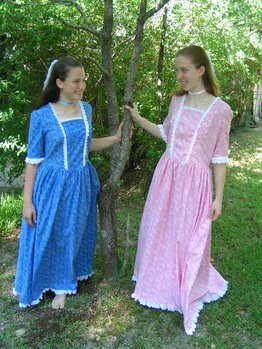 The dresses look like they turned out great! The ribbon and chokers were good ideas too. Oh, how beautiful! I love them...what pattern did you use? Are you two planning on wearing them any place special? 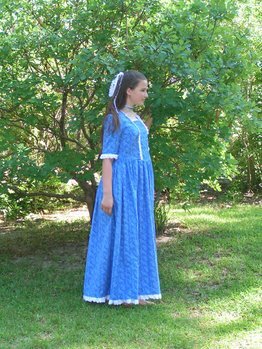 We used Simplicity costume pattern 5041. We're planning to probably make our "debut" in them at Elijah's graduation celebration, and wear them at for our band's solo and ensemble concert (in which we'll play a flute duet) this fall. I'm sure we'll end up wearing them other places as well, however! The funnest place would be to an old English dance... they twirl so nicely! The funnest place would be to an old English dance... they twirl so nicely! Oooh, yes...they do look very twirly and dancing in the old English fashion is so fun! yes it is! 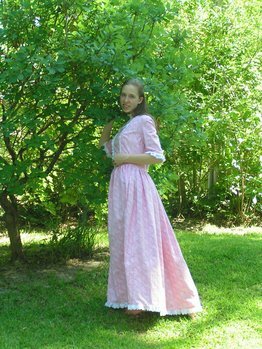 I've danced the Virginia Reel at a party with my daddy, and done a few old-English dances with daddy at a July 4th re-enactment. Square dancing is also tons of fun! At CTCI (the training center I'm going to this summer) they have square dancing every week, and it is so much fun! How lovely! You did a good job! when i had my 10th b-day we had an English tea party! We also had English dresses! it was alot of fun! Beautiful dresses! You did a great job! How adorable! When I was about 13, I made a dress like this with a bunch of friends. We had a sewing day similar to yours and then we had a colonial tea party afterwards! Wow! Good job! I hope to one day sew as well as you. I hope you write soon! I love those dresses! Well done! Thanks for the encouragement! No, I've never thought of selling dresses I've made... I barely have time to make some for myself! That's great! What pattern did you use? I've always loved historical clothing!! You both did really great jobs. And Miriam- kudos to you for your beautiful first dress! Oh, I see here. You already listed your pattern number. Thanks anyway!